As the Freescale Technology Forum 2015 is taking place in Austin, Texas, the company will announce a few new products over the 4-day conference. After the official launch of Freescale i.MX 7 series processors, Freescale unveiled a new product based on their existing i.MX6 platform with “i.MX 6Dual SCM” (Single Chip Module) that integrate a dual core i.MX 6Dual processor with 1 or 2 GB LPDDR2 (PoP), a 16MB NOR flash and a PMIC in a tiny, coin-sized module. There are also 109 discrete components on the module. BSPs for Linux and Android will be provided. 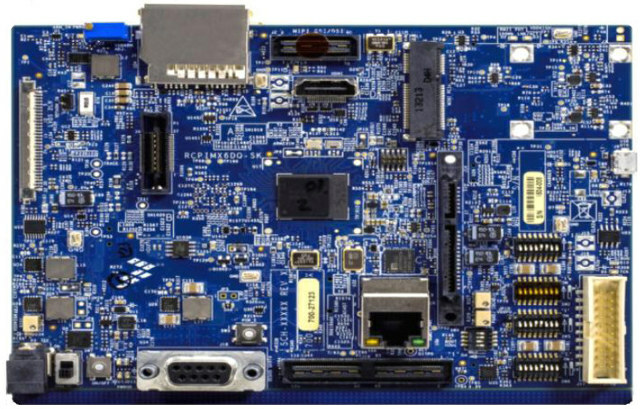 Optional modules adding HDMI output, LVDS (10.1″ display), WiFi, and others will also become available with the evaluation kit. 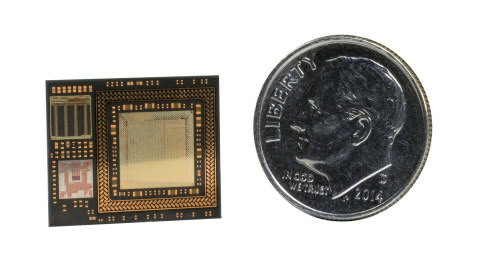 Freescale’s SCM modules are expected to be used in applications ranging from 3D gaming goggles, to “next-generation” IoT drones as well as other IoT products, a medical equipment, and autonomous sensing applications. The i.MX 6Dual SCM should become available in August 2015 either directly from Freescale, or through Arrow Electronics, and more SCM products are planned for the next two years. Check out SCM-i.MX6D product page for details. I don’t think so. My guess is that this combo will be more expensive than the sum of all involved ICs. That’s why even chinese companies that sell milion SoCs per month in price sensitive market are doing separate SoC+DRAM+FLASH. Multi-chip packaging technology is more expensive that regular PCB. For example, Allwinner’s A13 was TQFP to allow 4 layer pcb stack to reduce the total price. I wouldn’t agree, Nuvoton N32926 (https://www.nuvoton.com/hq/products/microprocessors/arm9-mpus/n3292-h.264-codec-series/n32926u1dn/?__locale=en) is about 7 USD, those things to manufacture huge package chips that require 8 and more layers PCS, huge number of external components seems to me like protectionist business practices to make the business available just to certain companies. The most cost optimized solution I know of is the GrainMedia GM8136 ($4.80) + ESP8089 ($0.80). GM8136 does 720P H.264, runs Linux and has 128MB of memory on-chip. All you need to do is add the ESP8089 and a SPI flash chip. It is easy to build a complete solution for under $10. You mean GM8136S, where do you source it ? I had inquiries to some China based entities they wanted fees just for the SDK, which to the best of my understanding is GPL licensed. The price they offered for GM8138S was 30 USD/sample + shipping. In the past, I had quotation from Sacsys, they asked just for GM8128 EVK 3,500 USD. It is GM8136S. Just go into the Shenzhen Grain office, that is where we got our stuff. SDK is well under $1,000 but it comes with full development hardware and factory tech support. Chips in small quantity (<100) are about $7. $4.80 is by the reel. Grain has mixed their own proprietary code into the software, so yes some of it is GPL but they'd have to go through the effort to split it apart. I don't see them doing that anytime soon, and the GPL pieces are pretty much worthless without their user space stuff. Grain lowered the prices on their SDKs about a year ago, most are under $1,000 now. Some of the distributors are not paying attention and still sell at the old prices. I am working on a GM8138S design, it about the same as GM8136S but 1080P vs 720P. Thanks for the recommendation. I am also interested about GM8138S, but not sure if it will support WDR sensors like AR0331 as well as the situation with the low-light mode. It is advertised to support Low lux sensitivity to ISO6400. Might similar images to HikVision Dark Fighter DS-2CD6026FHWD in low-light conditions be expected, or it is just some basic image improvement ? Have you done any testing ? It supports the AR0331CS (2-MIPI), not the AR0331CM (4-MIPI). It actually support about 30 different sensors including some high end Sony ones. We have not tested extensively. We use the GM8138S inside a larger system to get three streams. The Freescale device has 2×32 bit memory bus (not 1×16 like some of the chips mentioned above) and more interfaces, 2x Cortex-A9 (not the old ARM9) and 2D+3D GPU… this is clearly not targetted at low-cost IP-Cams. John is it possible to buy about 10 modules GM8136S ? I want use it in our new products but I need to test it. This company is shipping a GM8138S based camera. You can buy and disassemble to get boards. a major issue with Freescale products is that probably in most of the cases you will not get what is advertised. For example, the GPU you mentioned, it suppose to provide 16-24 GFLOPS, in practice (https://community.freescale.com/thread/305327) people were able to obtain just 0.6GFLOPS. By the way I had similar issues with other peripherals from Freescale products. Issues associated with AR0331 and i.mx6 (https://community.freescale.com/thread/322170). It was actually interesting, how those people were intending to use AR0331 with i.mx6, since to the best of my understanding a complete WDR algorithm (including deghosting) requires more than 30k LUTs on FPGA etc. In addition, the mentioned solutions have integrated audio-codecs. On N32926 is kind of noisy, but can you point any SoC with integrated DDR that can run Linux in QFN88 package ? Another solution that was recommended is Hi3518E, 440 MHz ARM9, 512 Mb DDR2 from Hisilicon Inc. Some claim that is the best solution in China for IP cameras with the biggest market share. The price apparently is lower than GM8136S, but the encoding is limited to: H.264&JPEG streams: [email protected] [email protected] fps JPEG snapshot.